The four evangelists in symbolic form. The Book of Kells. Trinity College, Dublin. ca. 800 AD. 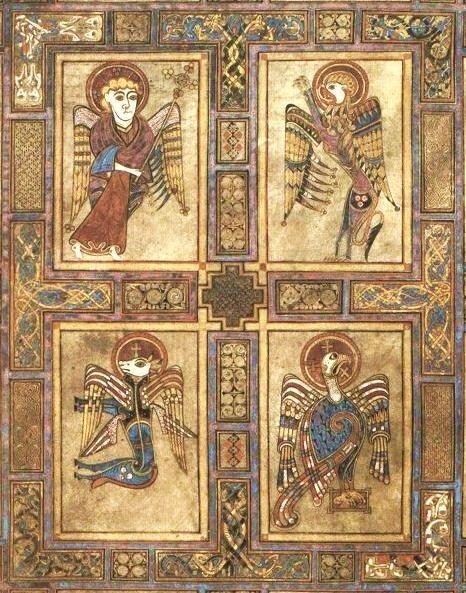 The Book of Kells features a plate depicting the four evangelists in their traditionally symbolic forms: Matthew [human/angel], Mark [lion], Luke [ox] and John [eagle]. There are several biblical sources for these symbols, including Ezekiel 1:1-14, Ezekiel 10:1-22, Daniel 7:1-8 and Revelation 4:7-8. Around the throne, and on each side of the throne, are four living creatures, full of eyes in front and behind: 4:7 the first living creature like a LION, the second living creature like an OX, the third living creature with a face like a HUMAN face, and the fourth living creature like a flying EAGLE. 4:8 And the four living creatures, each of them with six wings, are full of eyes all around and inside.